In its multi-process approach, GEFICCA also stands out for its ability to produce extruded and abutted parts. 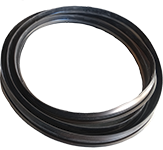 This process for shaping elastomers consists in continuously pushing the fluidized material through a die having the cross-section of the part to be obtained. The profile is then vulcanized discontinuously in an autoclave before being jointed by hot vulcanization.